Here in southern Mississippi it still feels like summertime, but last week we were teased with a couple of days of Fall weather and I didn’t want to let it go! I immediately wanted to revel in all the the things that scream Fall to me… apples and fires and cozy blankets and candy corn. Even though the weather didn’t cooperate for long (it’s hot again! ), I decided to pretend it’s still cool and crisp outside and bake up a new Fall dessert. Am I in denial? Of course! 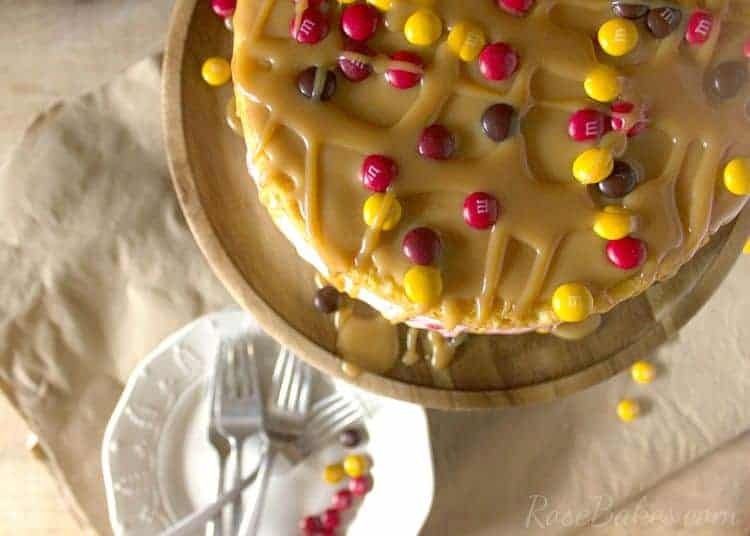 But it gave me an excuse to go ahead and bake this Caramel Apple Cheesecake Cake with M&M’s® Milk Chocolate Harvest. Ya’ll. 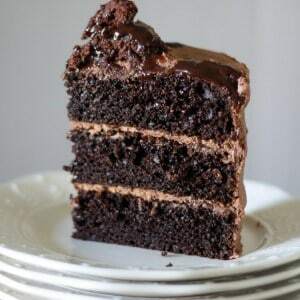 This cake is so, so good. It’s two layers of Pillsbury™ Moist Supreme® Caramel Cake with a layer of no-bake Cheesecake in between. 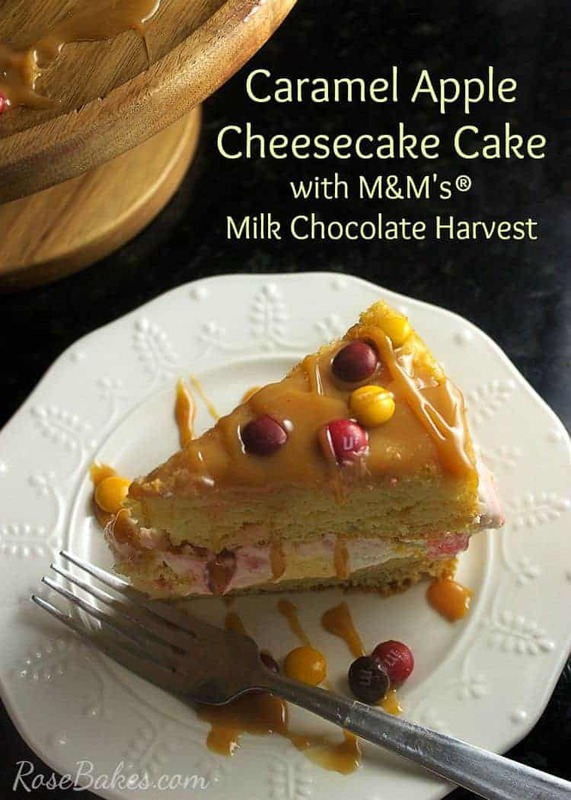 Of course, the cheesecake isn’t “plain”… it also has M&M’s® Milk Chocolate Harvest stirred in to add texture. 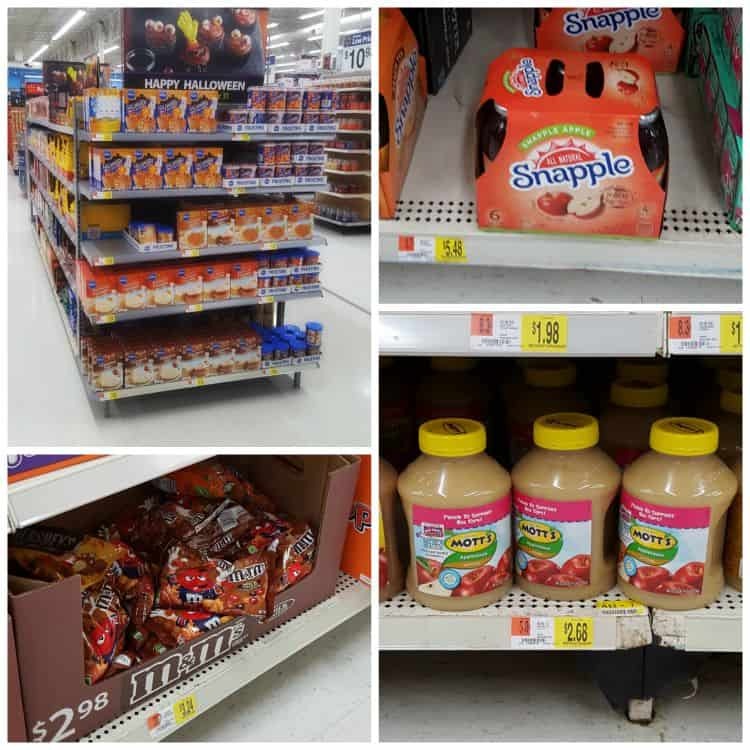 I bought the 6-pack of Snapple® Apple, but you can also get singles (which is all you’ll need for this recipe)! And if you happen to do any other Fall baking, be sure to enter your dessert in the #BakeintheFunSweepstakes for a chance to win a Kitchenaid Mixer… Woot-Woot!! 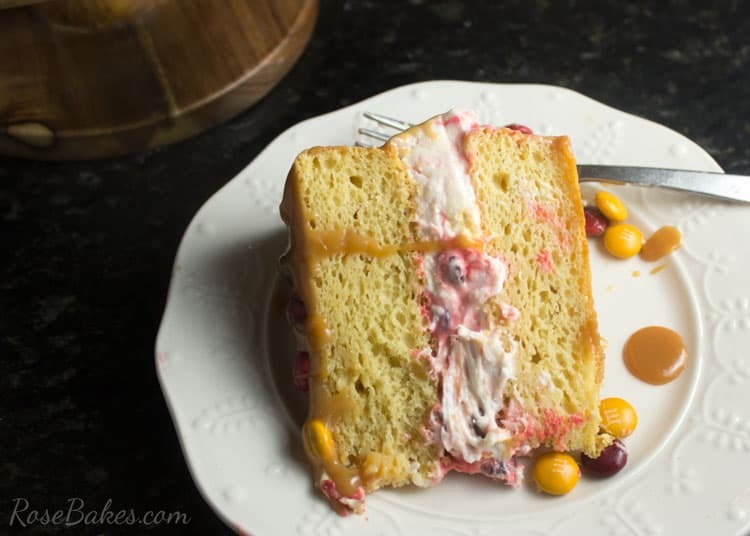 First up – you’ve gotta make the cake (all the details are at the bottom of the post). 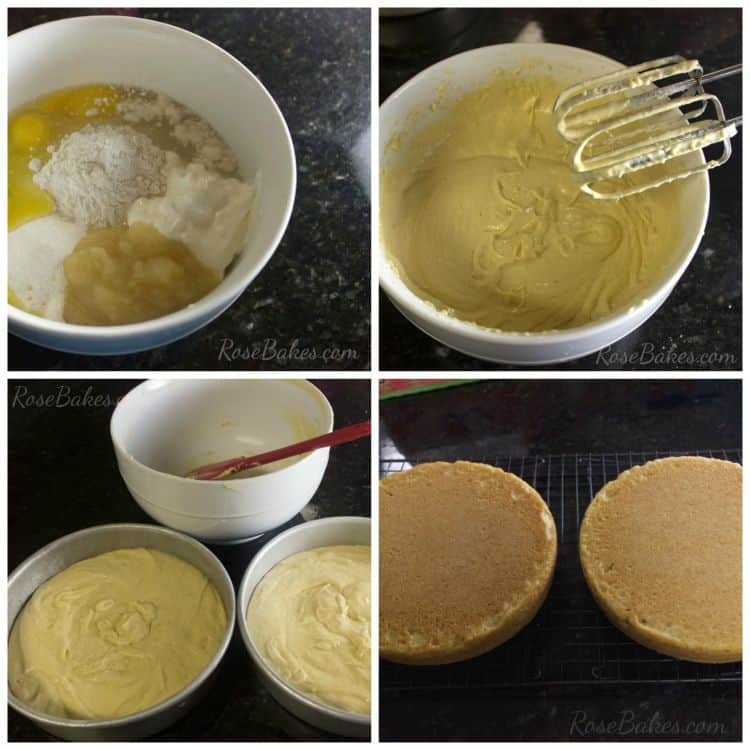 Start by mixing together the Pillsbury™ Moist Supreme® Caramel Cake Mix, Mott’s® Apple Sauce Original, eggs, water, sour cream and instant vanilla pudding. Then you’re going to divide the batter evenly between two 8″ round pans (sprayed with a non-stick cooking spray with flour – or painted with homemade cake release) and bake at 325°F for approximately 40 minutes. Check them with a toothpick to be sure they’re baked through, then flip them onto a cooling rack and let them completely cool! While the cakes are baking (and then cooling), go ahead and get busy making the cheesecake filling! You’ll need heavy whipping cream, cream cheese, sugar, vanilla, and a cup of the M&M’s® Milk Chocolate Harvest. Start by whipping the heavy cream until soft peaks form. 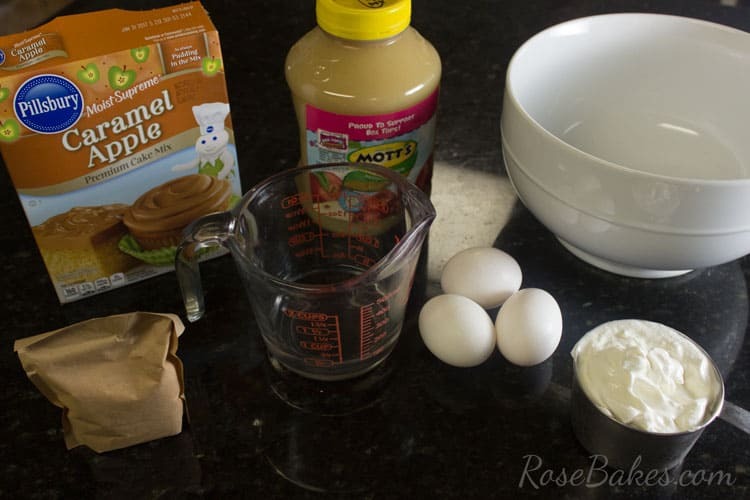 I like to do this in my stand mixer – it’s so much easier – but you can also do it with a hand mixer! Side note: you might notice in a later photo that I appear to have stiff whipped cream and no longer “soft peaks”… yeah, that’s what happens when you leave the room for a couple of minutes and your 4 year old turns the mixer back on. Oy! 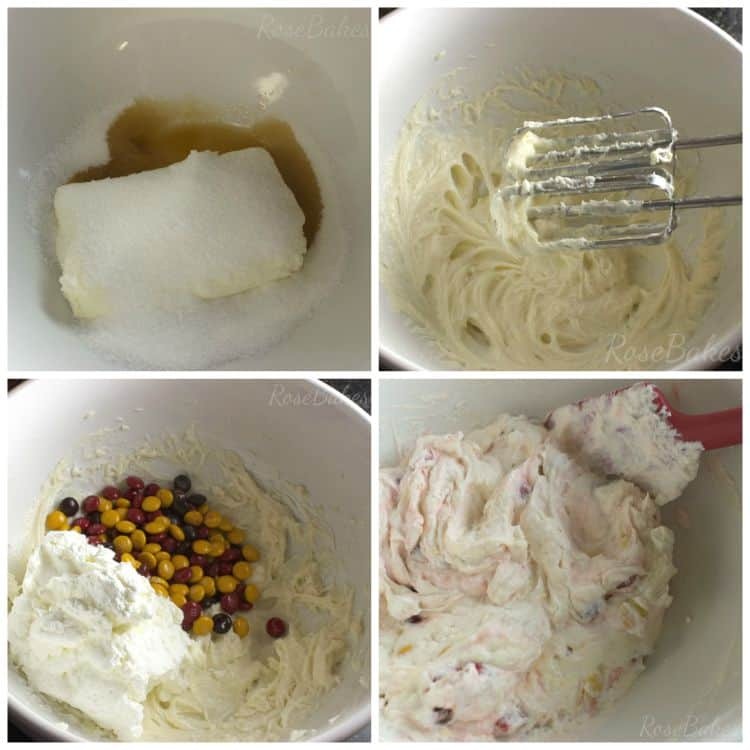 In a separate bowl, mix together the cream cheese, vanilla and sugar until smooth. Then fold in the whipped cream and M&M’s®. Be careful here to not over-mix. You just want to fold it together and be done. If you stir it too much and it starts to warm, it won’t hold up well when stacked. That step won’t take too long, so when you’re finished, pop it in the frig while the cake finishes baking and cooling. Then go ahead and make the caramel topping! You’ll need caramels (more than pictured here… approximately 14), a tablespoon of heavy whipping cream and a tablespoon of Snapple® Apple. 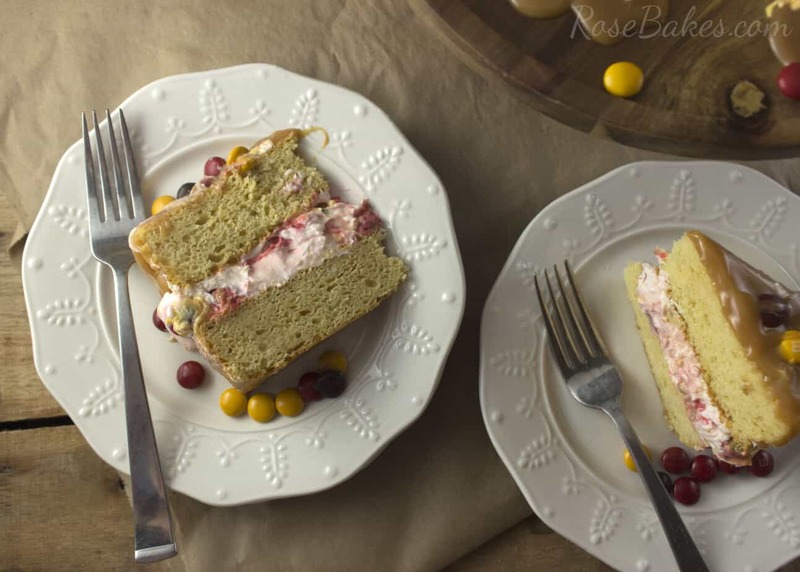 This sauce is so easy to make and has the tiniest hint of apple to compliment the cake. 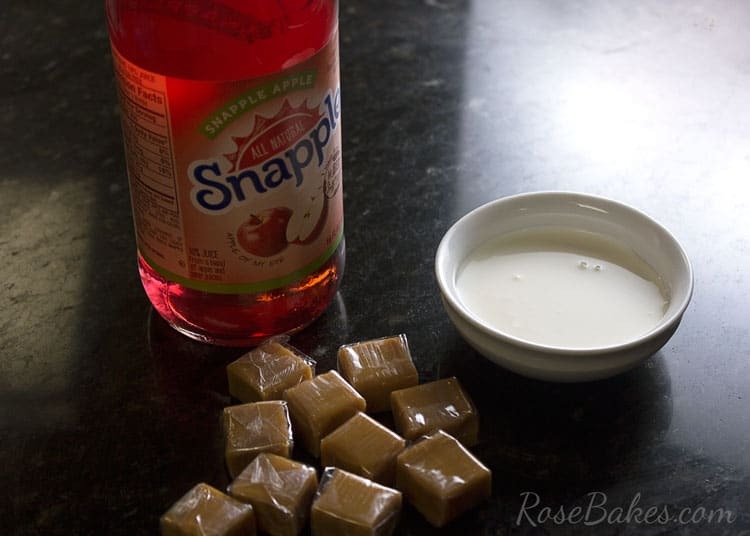 Just put the caramels, heavy cream and Snapple® Apple in a small bowl. Microwave for 30 seconds, stir, then microwave again. Repeat until completely melted and creamy. It only took me about a minute and 15 seconds. When everything is ready – assemble! 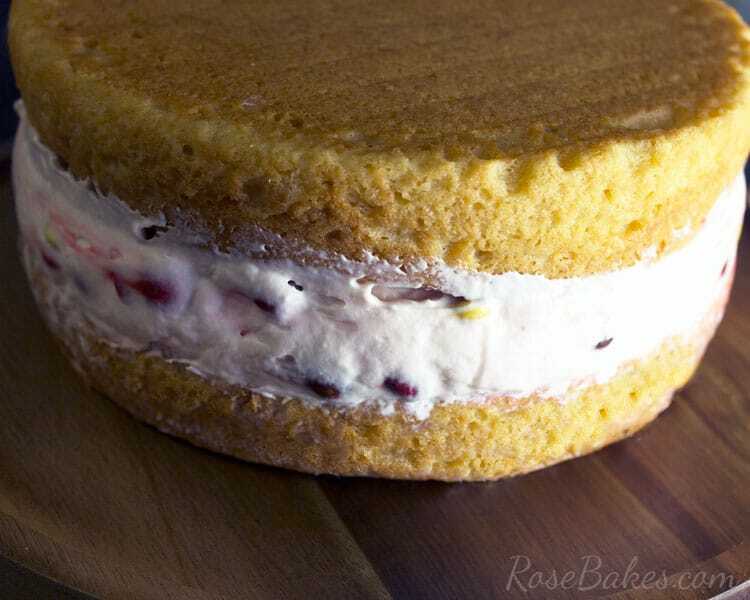 Start by layering the cake… cake, spread with the cheesecake filling, then the other cake! Easy-peasy! I used a spatula to smooth out the edges some! Next drizzle the caramel sauce over the top and sprinkle with the M&M’s® Milk Chocolate Harvest for a perfect and beautiful fall dessert! Be sure to check out other great MARS Harvest recipe ideas here and leave me a comment… I’d love to hear about your new favorite recipe! Alrighty – here’s the printable recipe for you and you can enter the sweeps below that! 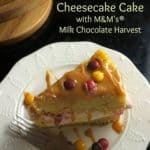 This Caramel Apple Cheesecake Cake with M&M’s® Milk Chocolate Harvest is one of the most moist, delicious, fall-inspired cakes I’ve ever made. You don’t want to miss out on this amazing dessert! For the cake, mix all ingredients together on medium speed for 2-3 minutes until well combined and smooth. Divide batter between (2) 8″ pans (prepared with Baker’s Joy or homemade cake release. Bake at 325°F for 40 minutes (or until toothpick comes out clean). 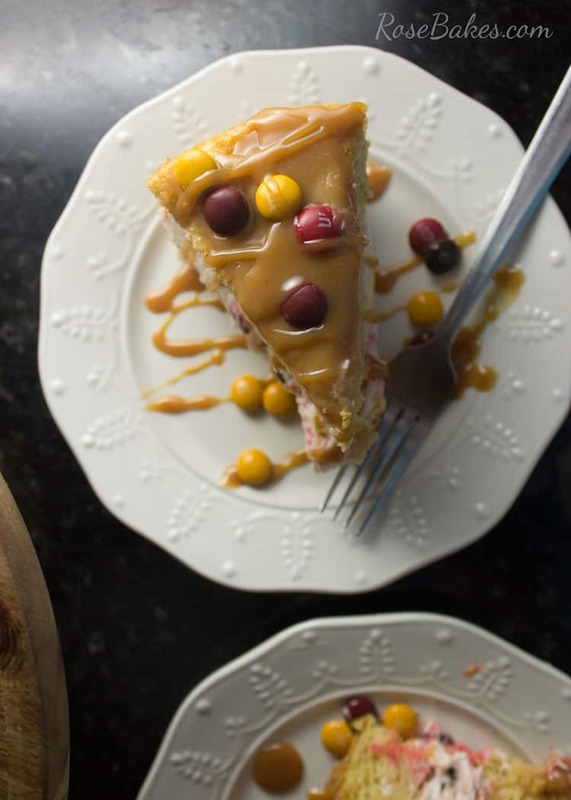 While the cake is baking and cooling, make the filling and caramel sauce. For the cheesecake filling, start by whipping the heavy cream. 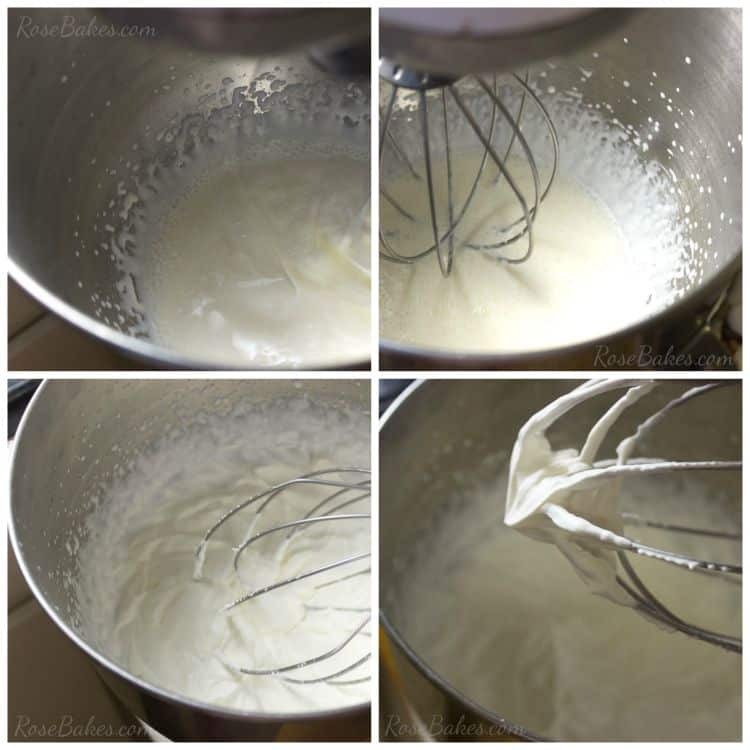 In a stand mixer or large mixing bowl, whisk the heavy cream until soft peaks form. 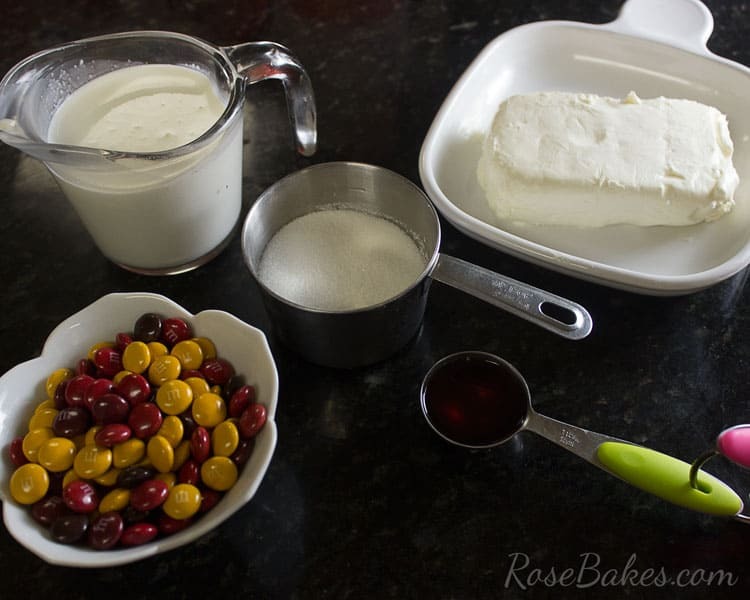 In a separate mixing bowl, beat the cream cheese, vanilla and sugar until creamy and smooth. Gently fold in whipped cream and M&M’s®. Chill until ready to use. 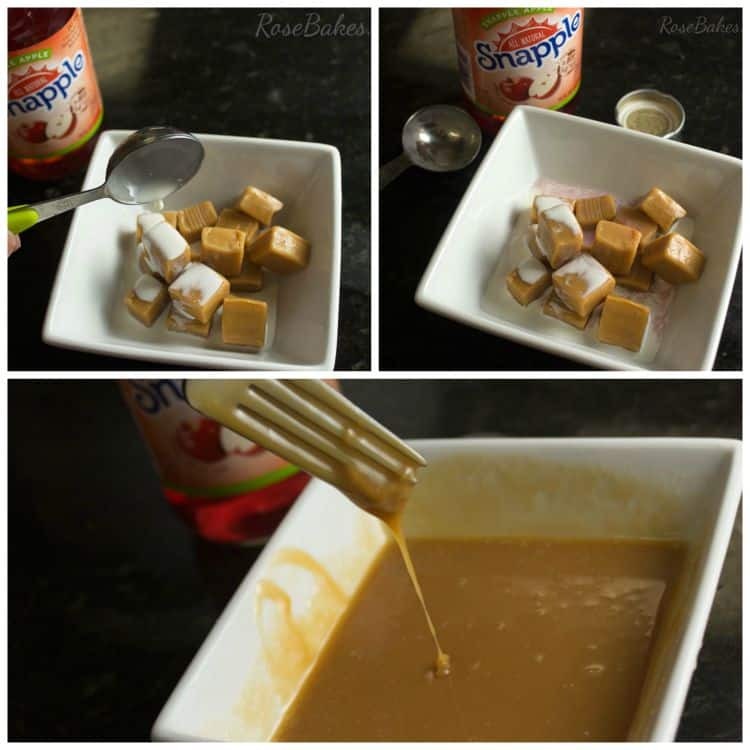 And then for the caramel sauce, put the caramels in a small microwave safe bowl (unwrapped of course), then pour the heavy whipping cream and Snapple® Apple over the top. Microwave for 30 seconds then stir. Repeat until completely melted and smooth. It took about 1 minute 15 seconds for me. Assemble the cake by stacking a layer of (completely cooled) cake, evenly spread the chilled cheesecake filling over that, then stack the second layer of cake. Drizzle with the warm caramel sauce (reheat in the microwave if necessary for 15-20 seconds), then sprinkle with more M&M’s® Milk Chocolate Harvest. Chill for at least 4 hours before serving! Enjoy!! Rose I want to make this cake but for some reason I can’t find any of the ingredients. What am I doing wrong or where do I go to get the ingredients. Thanks Rose. You should be able to see it now Elizabeth! Sorry about that! 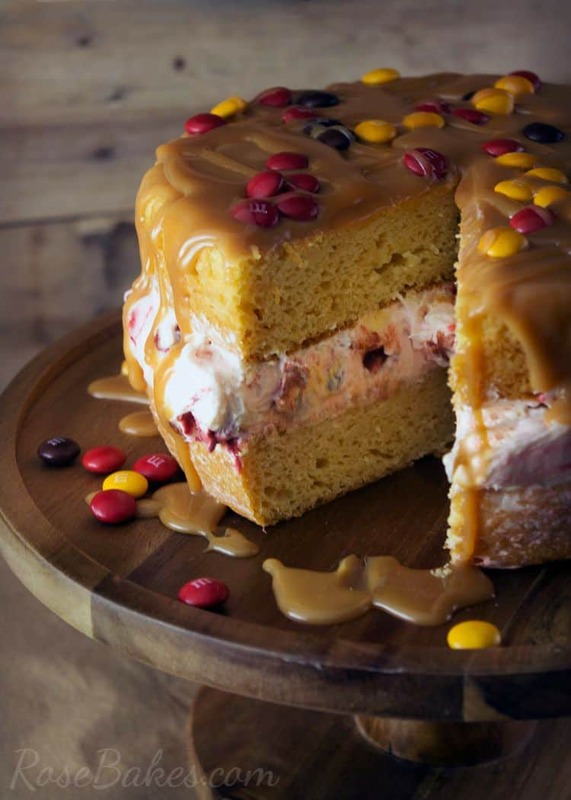 You had me at caramel, truly looks delicious! Oh! thank you so much Rose, now I can see all the ingrediens I need to make this delicious cake. Another question, do you know how much vanilla is used for the cheesecake filling? I don’t see it listed in the ingredients for the cheesecake filling but it does mention it in the directions. I’m just wondering if vanila isn’t needed since it is not listed in the ingredients. I’m so sorry Rose to be such a nuisance, but this is a beautiful cake and I can’t wait to make it and show it off and enjoy eating it with friends and family. I just want to make sure I have everything I need as listed before I make it so it will come out perfect like your cake did. Thanks again, Rose, you are the best!!!!! !